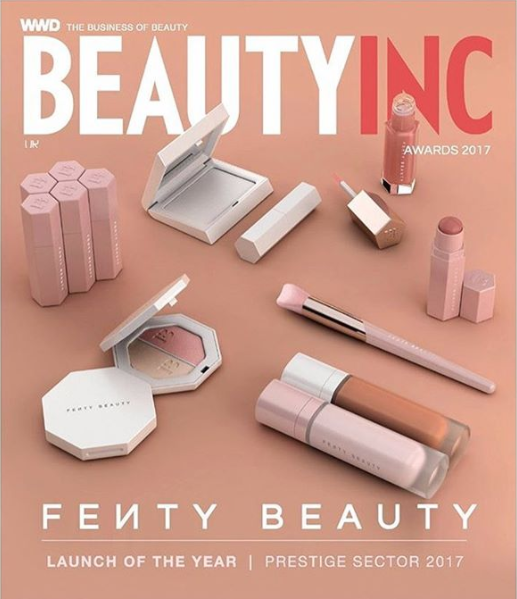 Rihanna's new makeup line Fenty Beauty doesn't debut until Friday, but the levels of excitement surrounding her new beauty venture have already reached fever pitch on the Internet — thanks to the bad gal's strong celebration of diversity in both Fenty Beauty's advertising campaign and with the products themselves. While the line's collection ranging from foundation to lip gloss (and graced with cheeky shade names like "Chili Mango" and "Trophy Wife") would no doubt be enough of a draw on its own, the Internet voiced its ardent support of Fenty Beauty when a campaign video for the line dropped last Friday. The video features 15 models of color with a diverse range of skin tones including 2018 Pirelli calendar muses Slick Woods and Duckie Thot and Muslim model Halima Aden, who sports her hajib in the campaign. While there's not an official release of the full cosmetics lineup available from the Fenty Beuaty, Internet rumors abounded after a Sephora employee said that the foundation would be available in an astounding 40 shades, providing a plenty of options for women with darker skin tones, an area where the mainstream beauty industry continues to fall short. According to an Instagram DM exchange posted by @rihannadailybeauty, it appears that Rihanna confirmed the 40 shades along with an affirmation that beauty should always be inclusive. Rih is doing a live stream on Instagram of the launch, just started!! Rihanna should have used her nice Fenty surname officially as an artist name too. Her artist name should have been Rihanna Fenty rather than just Rihanna, imo. It takes a lot to get the fashion crowd properly revved up at a catwalk show, but Rihanna pulled it off at her Fenty x Puma show in New York on Sunday night. It wasn’t the clothes that had the style press on the edge of their seats as much as the preamble, during which a team of motocross stunt performers vroomed up ramps and were propelled into the air to perform somersaults, flips and other seemingly impossible tricks. The striking set, which comprised towering spot-lit dunes of glittering pink sand, added to the drama. Death-defying stunts are a tough act to follow, but the models kept the energy high when they strode onto the runway. The cast included the gap-toothed, shaven-headed Slick Woods, who demonstrated the kind of personality that is all too often discouraged in models by dancing and waving her arm around as she stomped to the booming music. There were cycling shorts and wader-like overalls, bum bags, zip-up tops, wetsuits, high-heeled Puma-branded flip-flops and thigh-high boots which looked somewhere between Pretty Woman and a pair of galoshes. There was a preponderance of swimming suits confirming one of the oddest microtrends from New York fashion week so far: that of wearing swimsuits with very high-cut legs beneath shorts and skirts, with a few inches of bare skin left visible at the hip. Logos ran down arms and across chests, many of them saying “since 1988” which – as might be guessed – is the year Rihanna was born. Rihanna is one of a handful of celebrities with huge social media followings making inroads in fashion (see also Beyoncé, Kanye West and Justin Bieber) while traditional entertainment industry revenues decline. Whatever you think about that shift, in terms of representation, Rihanna is certainly a force for good. Not only were the models at the show ethnically diverse and exuberant but, on the preceding Friday, she launched her own beauty line, which, with 40 shades of foundation, is once of the most inclusive beauty ranges ever. Rihanna also knows how to make an exit. At the end of the show, rather than the customary bow, she appeared, resplendent in retina-searing green, and did a lap of honour on the back of a motorbike. 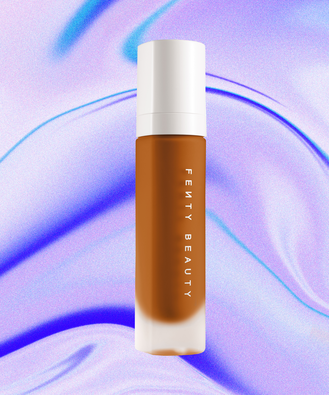 When Rihanna was developing Fenty Beauty, she made sure to cover all the bases, with a lineup that ranges from the essential (a versatile matte makeup stick that conceals, corrects, and contours) to the extra (the dazzling metallic gold Trophy Wife highlighter, which some might consider an essential in and of itself). But even more important than creating a universal lip gloss that magically looks good on everyone, the star also put a great deal of effort into prioritizing one crucial thing: inclusivity. But guess what? They did. 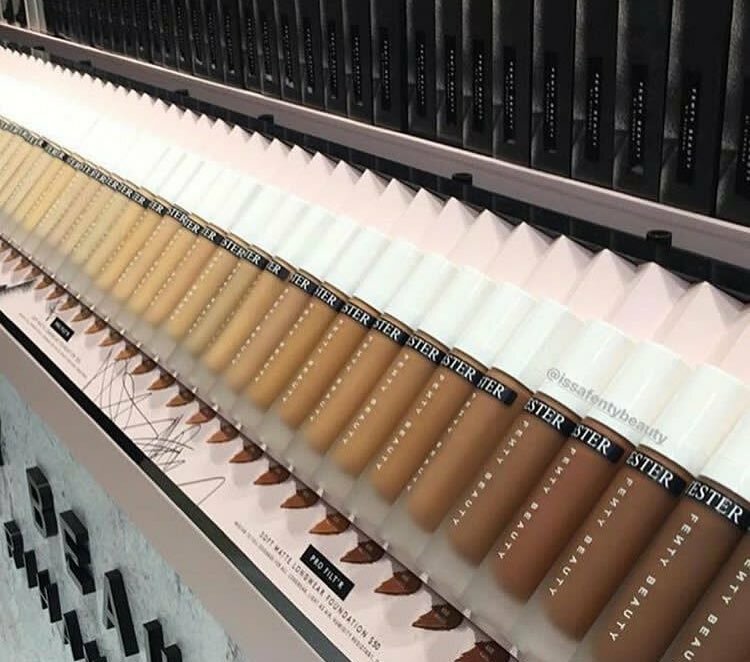 Now, a photo of a Fenty Beauty display at Sephora — showing the darker shades completely sold out — is going viral on Twitter. “The dark Fenty Beauty foundation shades are sold out everywhere!” the caption reads. “This is for all the makeup brands who think the dark shades won't sell well.” It’s hard to confirm whether or not a product is sold out “everywhere,” but a look at the Sephora website proves that several of the medium-to-deep shades (390, 400, 420, 430, 440, and 450) are indeed out of stock. This is exactly what fans hoped Rihanna would cater to when she launched Fenty — and RiRi did not disappoint. Except, of course, for those who now have to wait for a restock before they can get their hands on the perfect foundation match. She just teased on twitter, please let it be new music. how much longer is she going to be doing Fenty beauty and whatever else before we get an album then? Yeah that picture definitely looks Fenty Beauty related I'm glad that she is pursuing other interests outside of her music but she could've done this after the new album campaign rather than before it, which I don't doubt has delayed it further. Keep seeing that it’s a Fenty lingerie range?